Have you ever felt the need to fly the OtW flag, but it’s laundry day and your tee is in the wash? Well, help is at hand because I’m now stocking these delightful 1.5″ OtW button pins. As a teenage music fan in the 90’s, button pins were an integral part of music fandom, and my guitar strap was host to a constantly rotating cast of button pins by my favourite bands. So I am really pleased to have a limited stock of branded pins. Speaking of tees, I still have a couple of sizes left in both British Racing Green and Cardinal Red, as well as sets of stickers. Tees are priced at £20, stickers are £3 per set, and button pins are also £3 (all prices exclusive of shipping). I’ll also do some bundle deals for folk who order a tee with stickers or button pin. As always, to order or make an enquiry, drop me an email at kieran at over the wireless dot com. 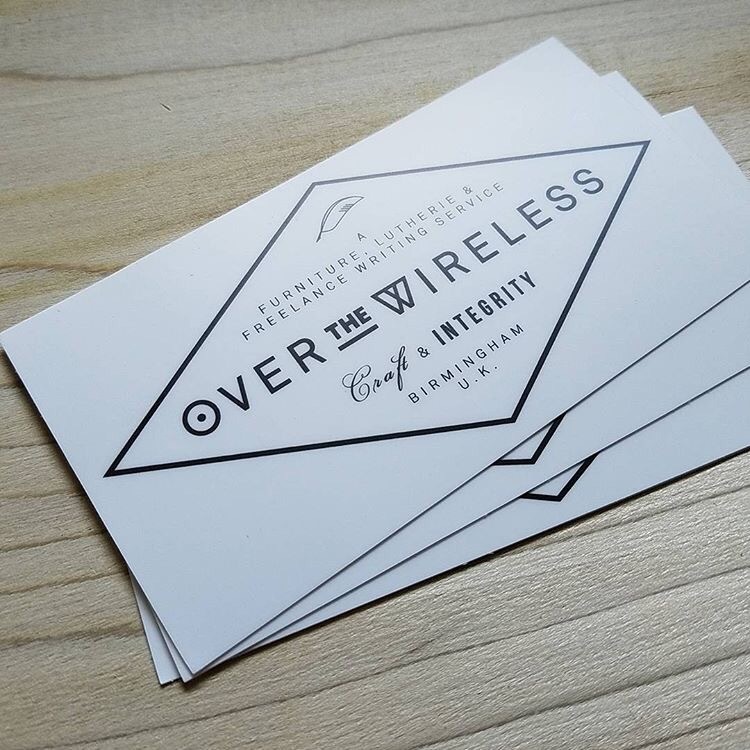 The next print run of Over the Wireless t-shirts has just landed, and pre-orders will be shipped out tomorrow. I currently have sizes L to XXL in British Racing Green, and M to XXL in Cardinal Red. Prices are £20 including shipping within the UK, £25 including shipping to the US, and shipping to other locations on request. OtW decals are also in stock, in two designs. A pair of decals (one of each design) is £3 including postage in the UK, or $5 including postage to the US. Other locations (as always) on request. If you would like to have the OtW logo displayed about your person or tool chest, and would like a t-shirt or decals, then drop me a line in the comments or at kieran@overthewireless.com. I can never guarantee that we will do another print run (although I hope to be able to) so if you’ve been holding on for a tee, now is the time. Handworks 2017 promises to be a really special couple of days, not least because it is just about the only time you can expect to find a significant proportion of our community all together in the same barn. And so I thought it would be fun to have some new OtW merchandise for the event. 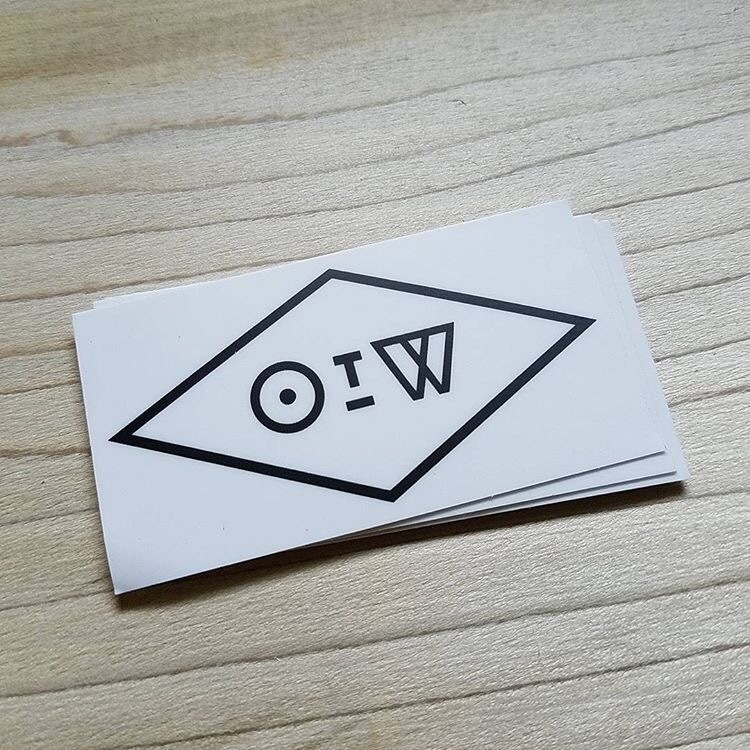 These OtW decals have now arrived from the printer, and Tom’s design work is looking as crisp as ever. But how do you get your hands on these stickers? Easy. Come and find me at Handworks – I’ll be helping out on the Sterling Tool Works stand, and also dashing about covering the event for Furniture & Cabinetmaking. The stickers are $2 each or $3 for the pair. 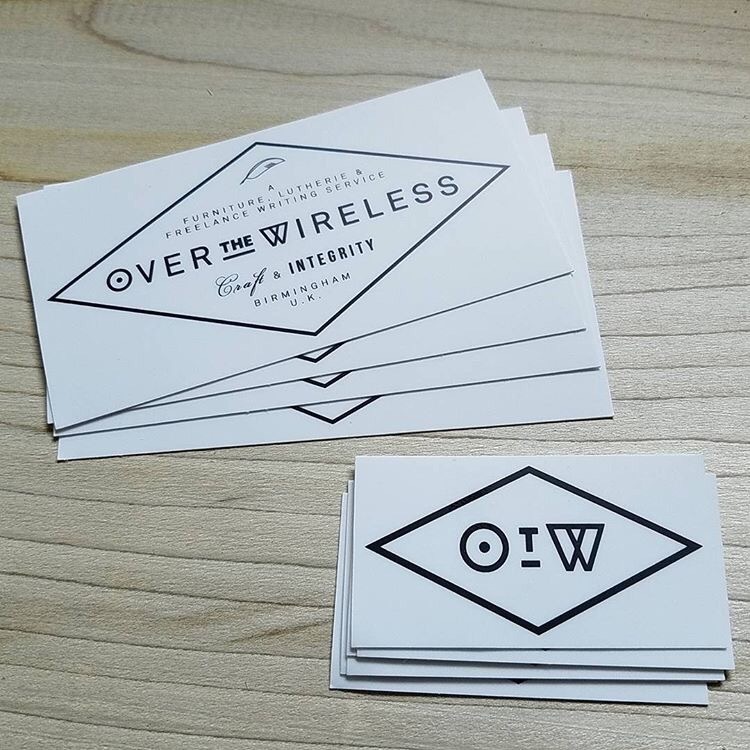 BUT if you wear an OtW tee to Handworks then you can claim both decals free of charge. I will also have a couple of OtW tees for sale (priced at $25 each). If you’re not going to Handworks, but will be at the European Woodwork Show in September, do not despair – I’ll have a fresh print run of the decals with me at EWS. If you’re going to Handworks let me know by leaving a comment below. Looking forward to steering everyone in Iowa next week! There may be better ways of starting a new year than with a new project, but I’ve yet to find any. I started off 2017 as I mean to go on – spending the first day of the year in the workshop breaking down stock for my next funiture build. It all seemed very appropriate. For this project I’ve been commissioned to build an oak side table and shoe rack to sit in a hallway. The client had a strong idea of what he wanted, but was open to some design input from me, and so we batted sketches back and forth until we reached the final specification. This was a perfect opportunity to apply the key design tenets from the Anarchist’s Design Book (a book that has had a significant impact on how I think about design), whilst meeting the specific dimensions the client wants (the piece will fit in a corner of the hall between a wall and radiator). We started with a low “boot bench” type design (and the name has stuck), although the final design did take advantage of the one dimension I could change, by increasing the height somewhat. Where we ended up was a 43″ wide, 14″ deep table with the top secured to the sides with through dovetails, while the four shelves (the client and his housemates have a lot of shoes!) are let into the sides with dados. To protect the wall behind from being marked by shoes, and to add rigidity to the piece, tongue and grooved boards will be set into a rebate and nailed to the back of the carcase. So, dados, rebates, cut nails, and tongue and groove backboards. That definitely sounds like an Anarchist’s design! The boot bench will stand on a period tiled floor, and the client wants to make a feature of the floor as much as possible. So one of the design questions was how to give the table a solid footing without obscuring the floor tiles. My suggestion was to carve the bottom 3″ of the sides (up to the lower edge of the first shelf) into a cyma reversa foot detail similar to the feet of my Roubo bookstand build. This retains a good base for the table, but still allows sight of the floor tiles. The table will be finished with shellac and topped with a home brewed hard wax (the recipe for which is courtesy of Derek). With the design agreed, my next stop was Sykes Timber, who were able to provide some gorgeous 15″ wide 5/4″ thick oak boards. These lay in stick in the workshop for November and December, before being broken down and moved into the house to acclimatise. Drawing full sized plans – I wouldn’t want to be without my set of Roubo curves by Sterling Tool Works for drawing curved parts. Working from scaled drawings is all well and good if you’re following instructions from a design someone else has tested, but when building a brand new design I’m not happy putting saw to wood until I’ve worked up a full sized drawing. I find that making a full sized drawing gives me the opportunity to spot any design issues I’ve overlooked, and also to clarify in what order I need to carry out each stage of the build. I like rolls of lining paper for making full sized plans, as you can cut each piece to the precise length you need it, and the thick paper is quite durable. And so over Christmas I hunkered down and drew full size front, back and side elevations for the boot bench. With the drawings complete I then wrote a detailed list of each stage of work, making sure that each stage followed logically and wouldn’t complicate any stages that followed. This will be my masterplan for the build going forwards, so is worth getting right! Laying out the top and sides on one of the 15″ wide boards. The moment that you start to work on rough boards always feels transformational to me – taking splintery and dirt encrusted timber in order to realise the beauty and furniture within. It can also be a somewhat nerve wracking moment – you only get one chance to make that first cut! S0 only once I was happy that the design worked, and that the dimensions would fit in the physical space the client has available, did I start thinking about breaking the oak down to size. If I’m honest, making the three cuts for the top and sides took over an hour, and even after a lot of careful checking I was still a touch nervous about cutting such beautiful stock. Having pulled the three oak boards out of their resting place, I selected the best board for the casework, and spent time laying out the top and sides so that they would run sequentially along the one board, avoiding any knots or shakes. These boards were very clear, but in any wide stock there is bound to be a couple of minor defects. Having laid out the cuts for the top and sides on one face of the board, I flipped it over to make sure there weren’t any surprises on the other side. Through careful layout I was able to place the few knots in areas where the foot detailed would be cut away, or in waste sections. The other two boards provided the four shelves. Breaking down 9′ long boards by hand definitely makes me want to build a third saw bench to support the extra length, but the two saw benches I do have worked perfectly and provided a lot of support to these wide oak boards. The Skelton panel saw is a monster, munching through the wide oak like it wasn’t even there. That saw is definitely a worthwhile addition to my tool chest. For breaking down rough stock the Skelton Saws cross-cut panel saw and a pair of saw benches is the perfect combination. The stock is now safely stored in the house to finish acclimatising before I start work on the build proper, more of which next week.